This Georgetown Pine Pantry Pie Safe has beautiful antique looking tin doors which give this a unique look for your kitchen, pantry or dining room. 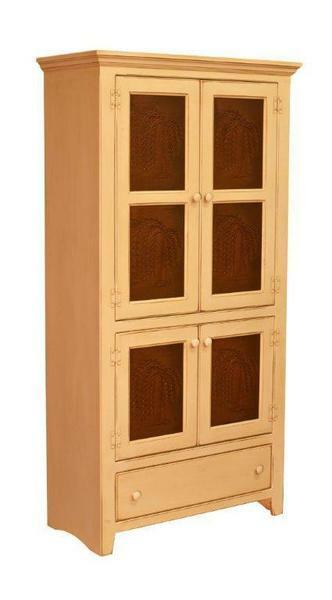 Choose one of our popular painted finished for this Pine Pantry Pie Safe Cabinet or go with a more classic stained look. We are happy to send out finish samples before you place an order. Call us at 1-866-272-6773 to place an order today. This Amish Pie Safe Cabinet comes with 2 adjustable shelves in the top and 1 adjustable shelf in the bottom. The bottom drawer has full extension drawer slides.